Image from 1915 Suffolk Chronicle & Mercury. Died: 21st December 1914; age 23; KiA – Allomagne whilst leading his men out of a hot corner when he received his death wound. Served almost 7 years. Employed: at the Grey Friars Works, Ipswich. Enlistment: Ipswich; Date: 29th March 1909; Occupation: Baker. 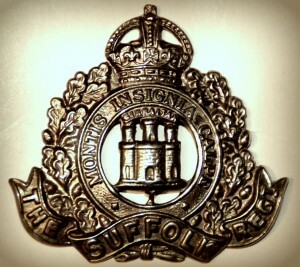 Regiment: Suffolk Regiment, 4th Battalion ‘D’ Company. Relatives Notified & Address: Son of Mrs E.S. Welton, of 12, Providence Street, Ipswich. 1901 Castle Street, Woodbridge, Suffolk. William was 9 years old and living with his mother & step father & step siblings. He was recorded as Knights on the 1901 census. 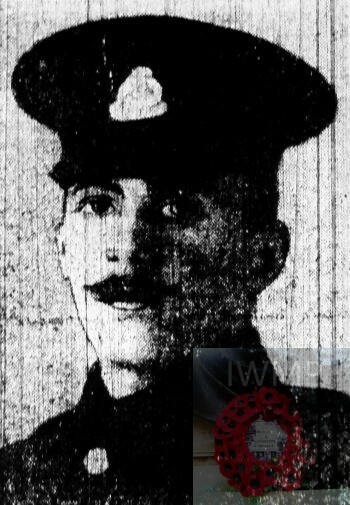 William Johnson Welton, 27, a Gilder, born Woodbridge, Suffolk. Elizabeth Sarah Welton (nee Knights), 28, born Ramsholt, Suffolk. Julian Johnson Welton, 5, born Woodbridge. Frederick Thomas Welton, 3, born Woodbridge. Hilda Rose Welton, 2, born Woodbridge. Wallace Powell Welton 8 months, born Woodbridge. 1911 3 & 5, Crown Street, Ipswich. William was 20 years old, an Assistant Baker – Bread. He was 1 of 3 baker’s living at the home of 44 year old, Emma Wells of Attleborough, Norfolk. Soldiers’ Effects to William Johnson Welton & Elizabeth S. Welton – parents. 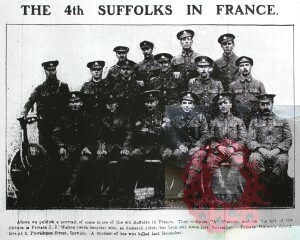 On 20th December 1914 the 4th Battalion the Suffolk’s reached the village of Givenchy next to La Bombe Crossroads, near Neuve-Chapelle, and La Bassée Canal. Setting out from the village of Givenchy-lès-la-Bassée, B Company crossed the canal and joined the 1st Manchester Regiment at the Village line. C- Company on the edge of the canal rise and D-Company in the support trenches at the brewery. A-Company became the reserve in Cuinchy. During that afternoon the Germans attacked and captured a large part of the village but were repelled by the 1st Battalion the Manchester Regiment and “B”- Company 4th Suffolk Regiment Casualties were recorded as “light” this was one of the first battles the 4th Battalion took part in of the defence of Givenchy. 22nd December the Battalion left the line returning to Beuvry.